The Ducks have signed defenseman Mathieu Carle to a one-year contract. Per club policy, no financial terms were disclosed. 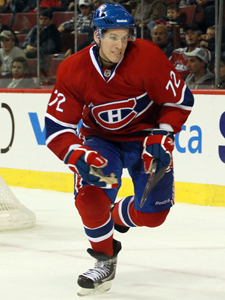 Carle, 23 (9/30/87), was acquired on July 15 from the Montreal Canadiens in exchange for defenseman Mark Mitera. Carle appeared in 68 contests with the Hamilton Bulldogs of the American Hockey League (AHL) in 2010-11, collecting 11-18=29 points with 44 penalty minutes (PIM). His +19 rating ranked third on the club and his 29 points ranked third among club defensemen. Carle also added 3-9=12 points in 19 Calder Cup Playoff contests, leading all club defensemen in goals and points, while sharing the team-lead among blueliners in assists. The 6-0, 200-pound Carle helped lead the Bulldogs to game seven of the Western Conference Final, where the club was eliminated by the Houston Aeros. Carle also represented the Western Conference at the AHL All-Star Classic in Hershey, PA in 2010-11. A native of Gatineau, Quebec, Carle made his NHL debut with the Canadiens on Nov. 3, 2009 in a 5-4 win over Atlanta. In 222 career AHL contests, Carle has scored 30-67=97 points with 156 PIM and a +27 rating. In addition, he has collected 3-11=14 points in 26 career Calder Cup Playoff games. In 2007-08, he was the leading rookie scorer for Hamilton, scoring 7-17=24 points in 64 contests. Selected by Montreal in the second round (53rd overall) of the 2006 NHL Entry Draft, Carle appeared in 258 Quebec Major Junior Hockey League (QMJHL) contests, collecting 49-146=195 points with 311 PIM before turning pro. He was named to the QMJHL All-Rookie team in 2003-04 after scoring 11-12=23 points in 59 contests with Acadie-Bathurst. Carle had a career year in 2005-06 when he ranked second overall on the Titans in assists (18-51=69 points in 67 games).